Haute Sorelle: Haute Sorelle Launches Its First Product Line!!! 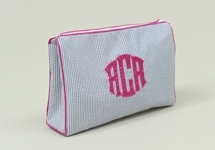 ...Made-to-Order Cosmetic Cases and Accessories. I am thrilled to announce the first product line Haute Sorelle is launching, fabulous cosmetic cases and accessories. These completely custom, personalized products are a MUST HAVE and the perfect gift for a friend...or a treat for yourself!!! Below is a sneak peak of some of the stylish merchandise that is now available. 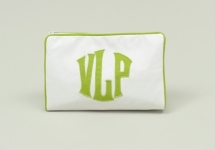 The above cosmetic bags come in three sizes: small, medium, and large. The made-to-order bags are truly UNIQUE because you can pick ANY color combination. There is a clear VINYL exterior option which makes them last FOREVER! I love these Zip Cases that are sold as a set of 3! 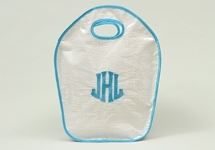 Perfect baby gift - Diaper Tote... throw in a diaper, bottle, and you will be one chic mom! For more information on products, swatches, and pricing, please contact me at hautesorelle@gmail.com. Pricing begins at $50 depending on style and custom options (with or w/out vinyl exterior, and number of letters in your monogram or name). Colors: You dream, we have it! I LOVE the diaper tote you gave Hadley! We get compliments all the time. : ) Those makeup cases look fabulous, too.